Even with the Sub-Saharan League making leaps and bounds in the field of global power, corporate intrigue and secrets seep in, infecting the growing power with corruption from the inside. Information is withheld, traded, and sold in hushed rooms, just like every other area of the world. Corporations still guard their secrets and agendas and the runners still work to leave them exposed. 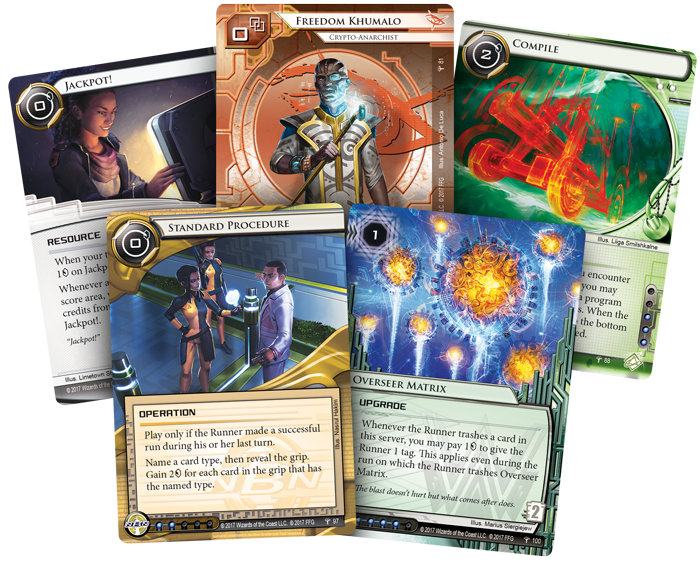 Fantasy Flight Games is proud to announce Whispers in Nalubaale, the fifth Data Pack in the Kitara Cycle for Android: Netrunner The Card Game, is available for pre-order now from your local retailer or our website! 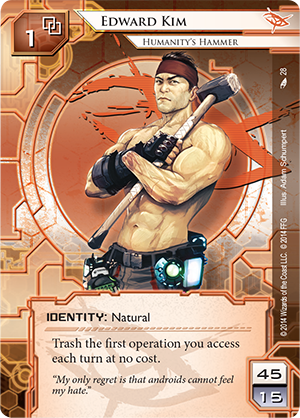 Whispers in Nalubaale introduces three copies each of twenty new cards spread across every faction, including a new Anarch identity that gives the runner new ways to spend their virus counters and a risky new tool for Jinteki that pays economic dividends as it invites the runner to explore their deadly servers. Runners take on the corps for a variety of reasons. Even in the world of Anarchs, the agents of chaos, motivations can be diverse. Some run for chaos and thrills, others for more selfless reasons. If information is truly free, then leaving it in the shadows is irresponsible. These are the thoughts of Freedom Khumalo (Whispers in Nalubaale, 81), one of the most skilled runners in the SSL. 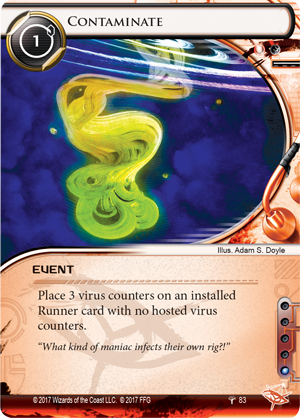 Anarchs excel in proliferating the spread of virus counters, as well as trashing cards from the Runner’s grip. Freedom combines these themes into one devastating ability, trashing a card once per turn by removing virus counters equal to its play or rez cost. Reminiscent of Edward Kim (Order and Chaos, 28), Freedom Khumalo can also trash operations (and other types of cards) that could otherwise be devastating should they be used. Freedom Khumalo also gives you a way to use virus counters that may have been useless otherwise. Every successful run becomes fruitful if you have the virus counters to spare, eliminating the corp's options while digging deeper to find agendas. 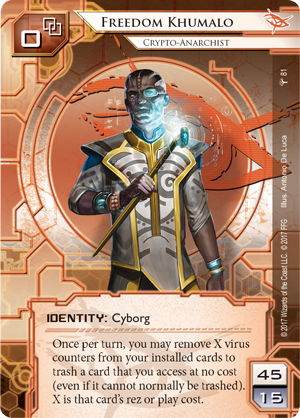 Freedom Khumalo is not the first card in the Kitara Cycle to give you new ways to use the virus counters on all your installed cards. 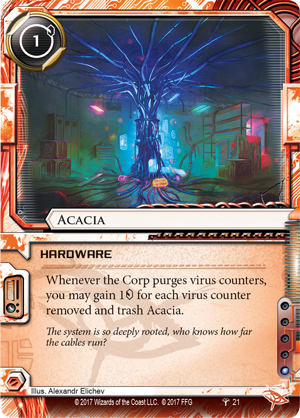 Acacia (Down the White Nile, 21) nets you a credit for every virus counter the corp purges, giving you additional incentive to load up on virus counters. This new focus on virus counters also makes cards like the new Contaminate (Whispers in Nalubaale, 83) valuable in multiple ways. 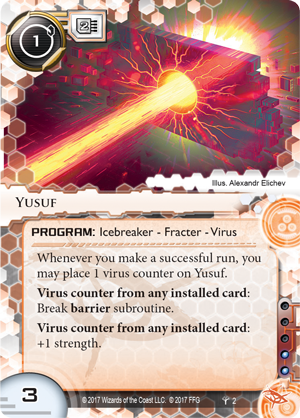 Whether it’s fueling an empty Yusuf (Sovereign Sight, 2) or simply dumping virus counters on a card for use in a larger plan, Contaminate puts the corp in a very dangerous situation. 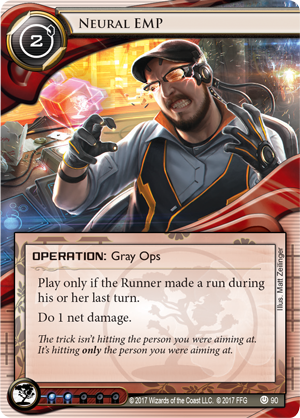 No matter which card you load the virus counters onto, Freedom Khumalo and the Anarchs can now take advantage of every single one, giving runners a brand-new way to interact with a mechanic that has existed since the genesis of Android: Netrunner. Of course, the corps all have their own ways of fighting back. Jinteki may roll out Viral Weaponization (Whispers in Nalubaale, 94) to both punish the runner and advance their own plans. 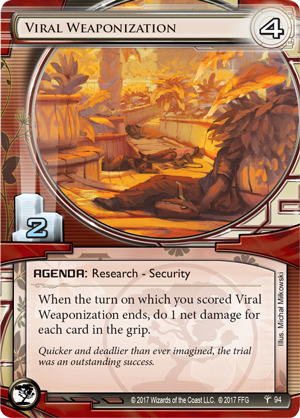 After scoring Viral Weaponization, you do one net damage for every card in the runner’s grip at the end of your turn. While this leaves the runner with an empty grip, you won’t have an opportunity to play a card like Neural EMP (Revised Core Set, 90) to finish them off, since they lose their cards at the end of your turn. 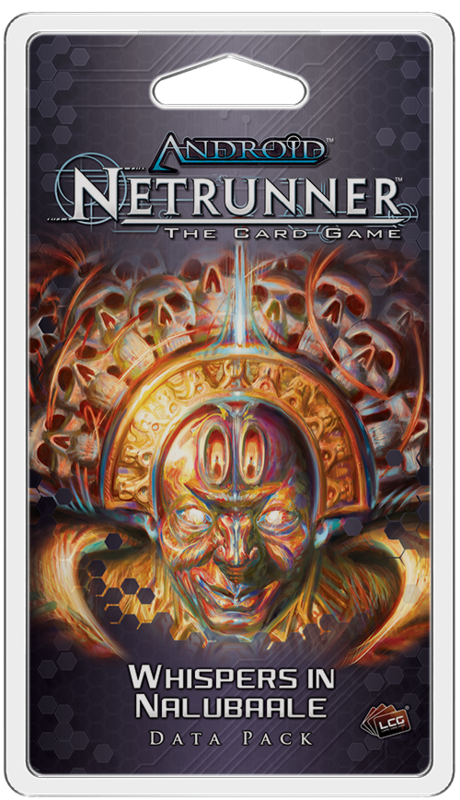 Still, the runner will likely have to spend their turn drawing cards out of fear of the neural power of Jinteki, taking up valuable clicks and giving you a potential scoring window. 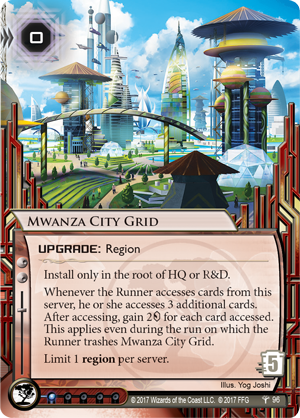 Jinteki also gains a new weapon in the form of the Mwanza City Grid (Whispers in Nalubaale, 96). As a region that can only be installed on HQ or R&D, Mwanza City Grid offers a high-risk / high-reward scenario. When a runner accesses a server that includes the Mwanza City Grid, they access three additional cards and you gain two credits for every card accessed. For a normal run, this means you will net eight credits after the runner accesses cards. While allowing the runner to access additional cards may normally be a poor prospect, Jinteki can thrive on the additional accesses. 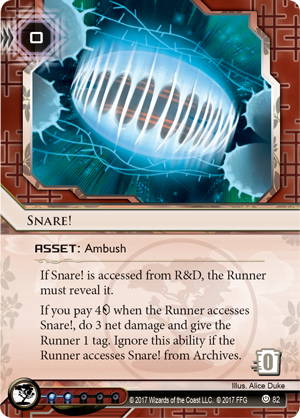 By stacking your deck full of ambushes like Snare (Revised Core Set, 82), the runner could be running headfirst into a trap while giving you additional credits. At a cost of zero credits to rez and five to trash, Mwanza City Grid will safely stick around as long as you want it, as long as you’re willing to accept the risk. Secrets are everywhere, whispered in the dark corners of the world. Will you work to expose the agendas hidden behind closed doors, or expose them to the world? Make your choice with Whispers in Nalubaale! Discover the secrets of the Kitara Cycle in Whispers in Nalubaale (ADN54) during the second quarter of 2018! Don't forget to pre-order from your local retailer or our website!